It seems today’s church is making some great strides in really big areas: loving the widowed and orphaned, adopting, helping to meet the physical needs of the world around us- just generally being the hands and feet of Jesus. I think that is wonderful!!! I think we need even more “big picture” thinking from the Church and fewer selfish attitudes and mindsets. That being said, Chase and I are seeing a common thread in our American churches that is exactly selfish attitudes and mindsets. We love the “big things” which entail loving the world around us and we should-it is very biblical. In my mind, family is a good picture of the kind of relationship you should have with your church. And church membership is a big deal, and one that needs to be approached with great thought and prayer. Once you are in it. You are in it. Leaving your church should also be approached with GREAT thought and prayer. Leaving a church is painful (or at least it should be) because of the relationships, service to that church and shared life you have with the people who make up your church. Leaving and joining another church feels like divorce and remarriage. It is a big deal. Ephesians 5 is a fabulous chapter, one of my favorites since it is mostly on marriage. I think though we can also apply those verses to our relationship with our church family, because they teach us how strongly Christ feels about the Church and shouldn’t we be like Christ and care about what He cares for? Jesus loves the Church and gave Himself up for it. ~How are you (how am I) giving yourself up for the Church in which God has placed you? Christ nourishes and cherishes the Church as His own body. ~How are you (how am I) cherishing your church and taking care of it as you do yourself? Christ cleans the Church with the washing of water by the Word. ~How have you (how have I) washed your church body with the Word of God lately? ~Did God place you in that Church Body? ~Are your grievances biblical or preferential? ~Have you addressed your grievances with the Pastor and leadership? ~Does only one spouse feel it is time to leave? If your husband does not think it is time yet, Honey keep your mouth shut. He is your spiritual leader and in charge of that decision. Even if he agrees that all is not well but it not ready to leave, let it be. Too many women are making this huge call (or pestering their husbands until they give in) and it is having devastating effects on the Church and their own families. Do not be that woman. Air your grievance, give your opinion and pray about the situation. Believe me. I know. SUPER hard to leave it at that. Spiritual discipline is hard, but the reality is that is not our call to make. Just one to support. I Peter 3:5 And I also believe many husbands would be wise to consider the feelings and thoughts of their wives. I believe women are gifted in intuition many times and pick up on something that isn’t right though they may not be able to put their finger on it. Don’t dismiss her gut feelings just because you don’t get it or see it. 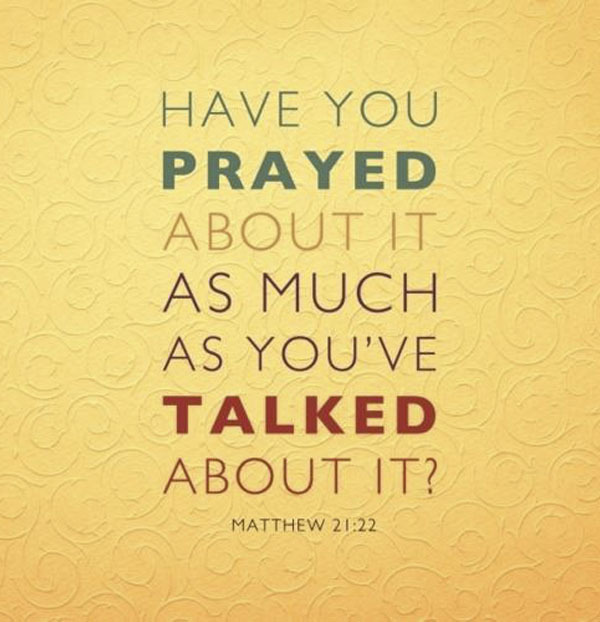 ~How much have you prayed about it? How much have you prayed for your Pastor and church body? How much have you prayed about the situation bothering you? Do you hate this question as much as I do??? ~What can you do to help the bad/unbiblical situation? ~Are you encouraging or discouraging your church body with your grievances? Are you working to maintain peace or are you causing further division? ~How aware are you that Satan is out to kill, maim and utterly destroy your church? I am serious. If your church is preaching the Bible and equipping the body of Christ you had better believe there are forces out to destroy it any way possible. This hit me strongly very recently when we were staying on the property of a struggling church (I haven’t updated this poor blog yet but we are in missions! YAY! So we are on furlough more or less. 😉 two different nights my son and I had very out of the ordinary, intense, demonic dreams that really opened my eyes to the battle going on there that we couldn’t see. My son does not have dreams that he really remembers at all much less could give me so much detail about and the detail stayed consistent when I asked him about it later. My dream was about people in the church family and my son’s was about the people while in the church building itself. There is a war for your church. What side are you contributing to? There is no neutral ground. After all of those questions, you have probably guessed that we by and large don’t encourage people to leave their church and that is an accurate guess. There are times when it is necessary but we don’t believe it is the majority of the time. I will also say that if after reading all of the above, you feel it is indeed time to leave your church, you need to be sure you are doing it lovingly, patiently and graciously. You do not act as though the people still there are traitors, (no matter your reason for leaving) you do not cause further dissension among the body that is still there and you do not gossip about your now previous church and pastor. End of story. I shouldn’t have to list verses for this one. Pretty Christian 101, right? I wish, but it is not always the case and unfortunately, I haven’t left a church sinless-ly myself. But our goal should always always always be unity, love, forgiveness, peace, grace and restoration. God bestowed all these on us when we could not have deserved them less…we ought to do the same for our church and church leadership at the very least. Let’s work on the small things. We need to get back to basics before we can make major strides in our world. Where is the love for our church? How should we respond when we struggle with issues and people in our local body??? “Let love be genuine. Abhor what is evil; hold fast to what is good.Love one another with brotherly affection. Outdo one another in showing honor. Do not be slothful in zeal, be fervent in spirit, serve the Lord. Rejoice in hope, be patient in tribulation, be constant in prayer.Contribute to the needs of the saints and seek to show hospitality. I know. The hard thing about church is that it is very personal. They are the family we chose and so when it gets dysfunctional or an individual hurts us it is personal. But this is life. People are people are people are people. No one is immune. No one is perfect. Everyone is hurting in some way. Everyone has blind spots. Everyone acts selfishly. But we need to give grace, forgiveness, love, truth and compassion to all-especially those closest to us, especially those who are of the household of faith. Let us pray we will respond to church struggles with grace, love, unity, time and prayer, not selfishness, ego, vanity and impulsiveness. We cannot expect to change the world with our love and unity if we aren’t loving and unified at home.